Some of our favourite things to see and do ... we hope you'll love them too! 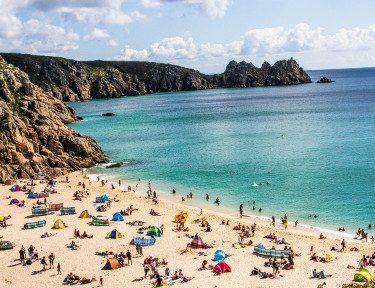 At Porthcurno you have fantastic attractions and activities on your doorstep, with many more within easy reach. Nature, walking, swimming, cycling, surfing, fishing, tennis, golf, birdwatching, painting, galleries, gardens... what do you fancy? A short walk away you have beaches, the coast path, a theatre, a tech museum, tennis courts, and several pubs and cafes. 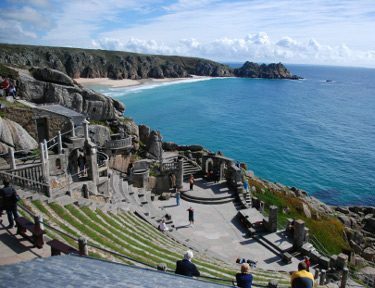 The world famous Minack Theatre offers open air performances twenty weeks a year in season, with matinees two days a week, and morning children's shows. You can discover the origins of the internet at the Telegraph Museum, as well as seeing the present day fibre internet connections that come ashore at Porthcurno from the rest of the world, and you can even tour their bombproof bunker. 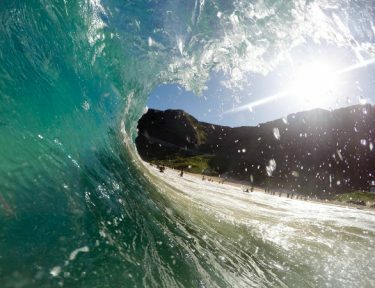 Catch a wave at the popular surfing beach at Sennen just a few miles away, or check out the surf schools and outfitters there if you want to try something new. Birds and birdwatchers flock to West Cornwall for special sightings, especially along the Soutwest Coast path which wraps all around the coast of Cornwall. And you can travel back in time along footpaths through ancient farming landscapes, and visit neolithic villages such as the one at Carn Euny with its underground chambers you can creep into. Or shop the old, fresh way at weekly local farmers markets in Sennen and St Just. 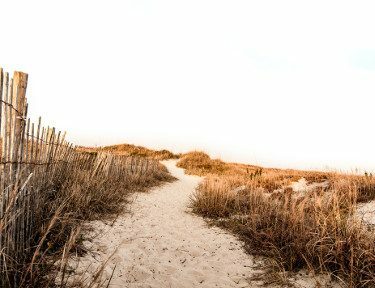 You could spend entire weeks touring favourite Cornwall landmarks such as Land's End, The Tate Gallery in St Ives, St Michael's Mount in Penzance, the Eden Project, Heligan Gardens and other prized sub-tropical gardens, or the historic Geevor Tin Mine, and various stone circles in use by pagans even to the present day, or night! The magical light of west Cornwall has attracted vast number of artists past and present, as well as galleries and museums for admiring their work. You too can get creative just a few fields away with open classes at the friendly Land's End School of Art, or just stroll in solitude with your sketchbook or writer's notebook. Quaint St Ives is a tapestry of galleries and studios, and Penzance's Penlee Museum hosts a fine collection of Newlyn School paintings of 19th century fishing folk and their accommodation. And for Cornwall's rich geology, try digging into into the Royal Cornwall Museum in Truro. If you feel like you're in a film set here, you are! 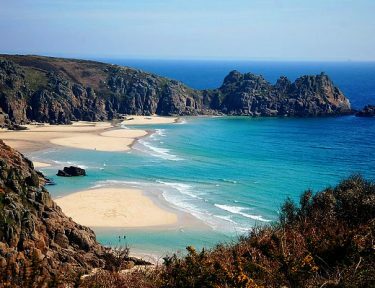 The Poldark TV adventure series set in wild 18th century Cornwall films at nearby Penberth Cove and Porthgwarra Cove, and even on Porthcurno beach, as well as at old mining sites just up the road on the north coast. The romantic novels of Rosamund Pilcher are filmed in Cornwall for German television, the movie Straw Dogs was filmed in St Buryan, and a major film about artists' love affairs, Summer in February, was also filmed on Porthcurno Beach. And did you know that while walking the coast path you also pass very close to the hideaway where writer John LeCarre creates his famous spy novels for the screen? Drama ... with a dramatic backdrop! Perched high up on the Cornish cliffs, the world famous Minack Theatre is a spectacle in its own right ... coupled with fine theatre it is a must see for any visitor. Not one, not two but dozens of beautiful, sandy gems to while away wonderful hours, sunbathing, sandcastling, seashell searching, surfing ... and perhaps a spot of snoozing too! Tim Smit, who was also behind the regeneration of The Lost Gardens of Heligen, had a vision to help reconnect mankind with its living world around him. 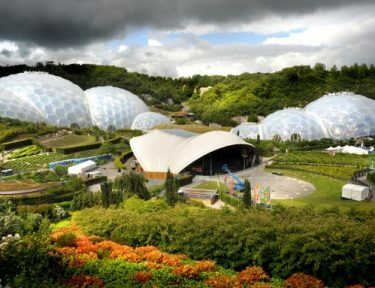 Huge Biom's house the worlds largest indoor rainforest ... but it's not just about plant's and flowers. You'll need more than one visit to fit everything in! It's not always hot and sunny ... sometimes there's a storm brewing ... and we just love them. Feel the energy of the sea and watch as the wind whips up the waves. 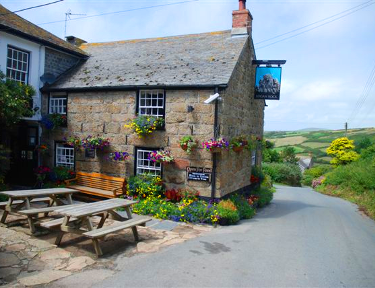 Shelter in a cosy pub nestling in one of the many Cornish Cove villages and watch the weather roll by. Artist have long trecked to the farthest reaches of Cornwall to paint these wonderful coastal views. But don't worry if you haven't packed your easel ... just look in awe at the breath taking coast. You can trek the entire South West Coastal path that passes right from your front door. Turn right for Land' End and left for Mousehole, Penzance and beyond. The fish is fresh, the cream is clotted, the pasties are 'Mighty' and we haven't even mentioned the scrumpy ... we hope you have a good appetite!